Massage bars are a lush product that I haven’t really fallen in love with yet. I find them great to use as an actual massage bar ( when I can twist my partners arm), but I find them a little to oily and greasy to use as part of my everyday skincare routine. Many people like to use the massage bars as a very moisturising replacement to a body lotion. However I tend to find then a little to messy and never really have the time to give my skin this luxurious treat. The Snow Fairy Sparkle massage bar was originally released in 2013 as part of the Christmas range and then made an appearance again in 2014. 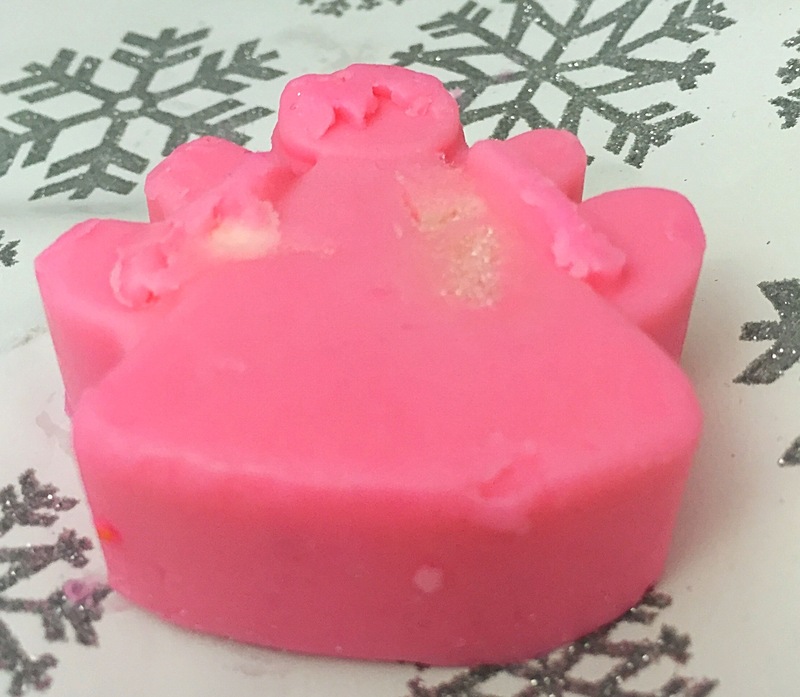 This very pink massage bar is shaped like a little fairy and shares its scent with the very much loved snow fairy scent. 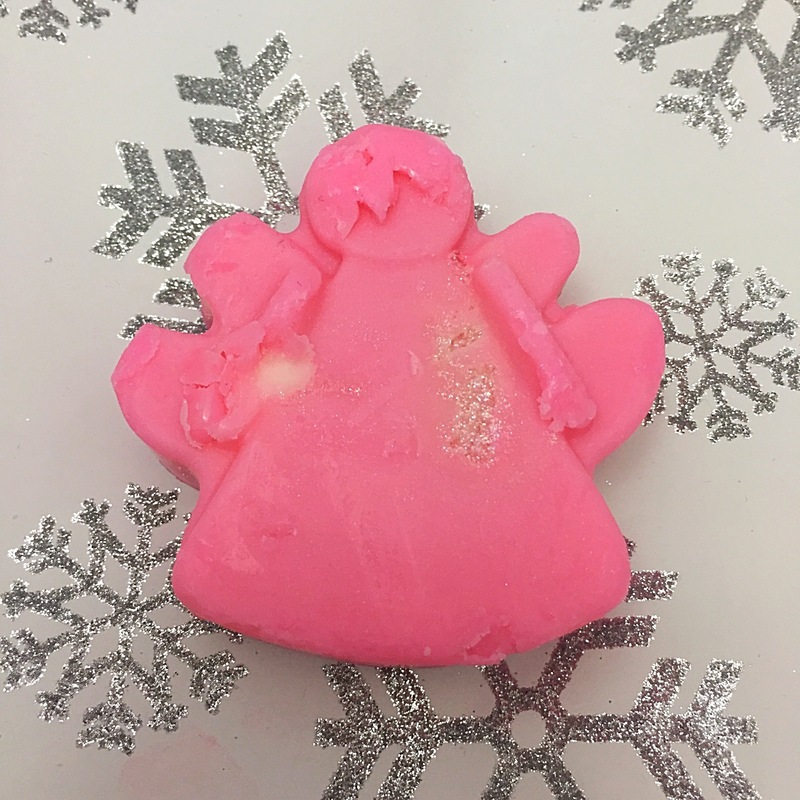 Snow fairy is a scent which is predominately featured at Christmas time (although it does pop up now and then at other times), it’s is a very sweet candy scent and is perfect for anyone with a sweet tooth. 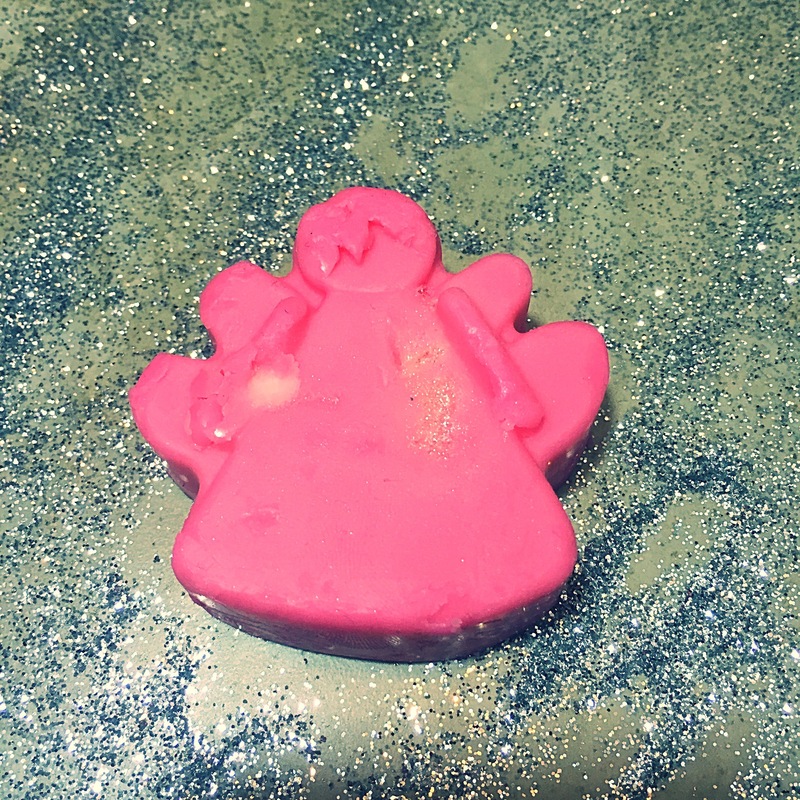 I absolutely adore the snow fairy scent as it was one of the first ever scents I tried from lush. So I was happy to put aside my judgment of the massage bar and give this little one a try. The Snow Fairy Sparkle bar is pretty small in size compared to most massage bar, if you are lucky you will get between 4-5 full body uses out of it, as it does seem to disappear very quickly. This little bar glides across the skin very smoothly as your body heat melts all the butter and oils. The scent heightens as it dissolved leaving a gorgeous sweet scent on your skin. I did find with this massage bar that the colour is particular strong and it does seem to leave a lot of colour on the skin, which in turn transfers on to clothes. Once you reach the white core of this bar you are also greeted with a lot of shimmer, I quite like shimmer, but I no a lot of people are not to keen on lots of glitter and looking like a disco ball. Overall I actually enjoyed using this product, although I wouldn’t make it a regular product it is quite nice to treat you skin with every know and then. The scent is Devine and the design of this bar makes it the perfect addition to a Christmas range. Whats your favourite massage bar? Which should I try next? TOP TIP: if you pop a chunk of this massage bar in to a wax burner it will fill your room with a lovely snow fairy scent. (please not this is not advised by lush and I can not be held responsible for any damage caused from trying this sweet smelling top tip). INGREDIENTS: Organic Shea Butter, Murumuru Butter, Almond Oil, Illipe Butter, Organic Agave Syrup, Perfume, Cupuacu Butter, Glycerine, Synthetic Musk, Calcium Sodium Borosilicate, Tin Oxide, Titanium Dioxide, Methyl Ionone, Benzyl Benzoate, Colour 45410. Ah I miss this one!